7 November 1917: Entered the Army as a Fahnenjunker in the Replacement Battalion of 10. Württembergisches Infanterie-Regiment Nr. 180. 6 March 1918: In the field with Infantry Regiment 180. 28 March 1918: Wounded during the attack on the Scarpe, France/in hospital. 22 April 1918: Transferred to the Replacement Battalion of Infantry Regiment 180. 31 May 1918: In the field with Infantry Regiment 180. 10 July 1918: Transferred to the Replacement Battalion of Infantry Regiment 180. 16 July 1918-14 October 1918: Detached to the Fahnenjunker Course in Münsingen. 13 April 1919: Transferred to Württemberg Security Company 8 in Gmünd. 27 July 1919: Transferred to the I. Battalion of Schützen [Rifle]-Regiment 26. 4 November 1919-2 December 1919: Detached to the Sports Course in Cannstatt. 16 May 1920: Transferred to the II. Battalion of Reichswehr Infantry Regiment 26. 1 June 1920-30 September 1920: Detached to the Sports Course in Cannstatt. 1 October 1920: Transferred to Infantry Regiment 13. 1 November 1920: Company Officer in the II. (Schützen-) Battalion of Infantry Regiment 13. 5 May 1923-26 May 1923: Detached to the Gliding Course in Münsingen. 1 May 1924-15 August 1924: Detached to the Weapons School Course at the Ohrdruf Troop Training Area. 9 January 1925-21 February 1925: Detached to the Signals Course in the 5th Signals Battalion. 23 February 1925: Signals Officer of the II. Battalion of Infantry Regiment 13. 5 March 1925-7 March 1925: Detached to the Snow-Shoe Course. 22 April 1925-3 May 1925: Detached to the Sports Course with the 5th Division. 20 November 1925-3 December 1925: Detached to the Snow-Shoe Course. 1 April 1926: Adjutant of the II. Battalion of Infantry Regiment 13. 1 December 1927: Transferred to the 4th (Machinegun) Company of Infantry Regiment 13, detached from 1 April 1928 to the 8th (Machinegun) Company of the regiment – played an active part in the 1928 Olympic Games in Amsterdam (Modern Pentathlon). 1 October 1928: Transferred to the staff of Group Command 1 and detached to the Army Sports School. 1 April 1929: Adjutant of the Wünsdorf Army Sports School and Leader of Training for Officers in the Modern Pentathlon. 15 June 1931: Command of the Army Sports School nullified – service regulated by the commander of the 3rd Division. 20 July 1931: Detached for Leader Assistant training with the staff of the 5th Division. 1 October 1931: Transferred to the staff of the 5th Division. 1 October 1933: Officer for Special Employment to the Chief of the Army Command. 1 May 1934: Transferred to the Army Training Department (T 4) of the Reich Defense Ministry, on 1 May 1935 renamed the Reich War Ministry. 1 May 1935: While retaining his previous position, transferred to the General Staff of the Army for employment. 15 October 1935: Primary Consultant for Army Sports Training in the Army Training Department (T 4)/Reich War Ministry. Also served as a member of the German Olympic Committee for the Winter Games in Garmisch-Partenkirchen, 1936 Olympic Games in Berlin (Military Ski Patrol and Modern Pentathlon competitions). 12 October 1937: Chief of the 10th Company of Infantry Regiment 45. 15 July 1938: Operations Officer (Ia) on the General Staff of the 34th Division. 30 September 1940: Transferred to the General Staff of the German Plenipotentiary General to the High Command of the Romanian Armed Forces and Chief of the German Army Mission in Romania (General der Kavallerie Erik Hansen) and, at the same time, served as a Tactics Instructor at the Royal Romanian War Academy. 10 June 1941: Chief of the General Staff of the German General at the Finnish Headquarters (Liaison Staff North) (General der Infanterie Dr. phil. Waldemar Erfurth). 23 September 1941: Army High Command Leader Reserve. 1 October 1941: Chief of the General Staff of the Higher Command for Special Employment XXXVI Mountain Army Corps. 16 November 1941: Chief of the General Staff of the XXXVI Mountain Army Corps commanded by General der Infanterie Karl Weisenberger in Finland. 1 November 1943: Chief of the General Staff of the XIX Mountain Army Corps commanded by General der Gebirgstruppe Georg Ritter von Hengl in Finland. 5 February 1944: Army High Command Leader Reserve. 9 May 1945-December 1947: Prisoner of war (from June 1945 in Great Britain). 1953: Published Armee in der Arktis (Army in the Arctic), an account of the German campaigns in northern Finland and Norway during World War II. Knight’s Cross of the Iron Cross: 3 May 1945, Generalleutnant, Chief of the General Staff of the 20th Mountain Army. German Cross in Gold: 17 August 1944, Generalmajor, Chief of the General Staff of the 20th Mountain Army. Iron Cross, 1st Class (1939): 14 May 1940. Prussian Iron Cross, 2nd Class (1914): 18 June 1918. 1939 Bar to the Prussian Iron Cross, 2nd Class: 25 October 1939. Medal for the Winter Campaign in Russia 1941/1942 (“East Medal”): 24 August 1942. Lippe War Merit Cross: 1918. Wound Badge in Black – World War I award: 26 July 1918. Finnish Order of the Cross of Liberty, 2nd Class with Swords: 26 September 1941. 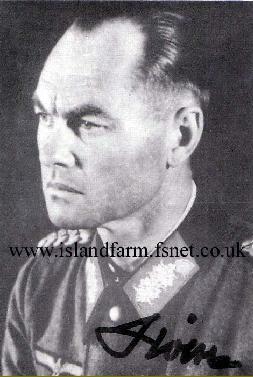 An outstanding General Staff Officer in the eyes of his superiors with a special inclination and ability as a troop leader, Hermann Hölter particularly distinguished himself during the withdrawal of the Lapland Army from Finland after that country’s capitulation. His quick and sound decision-making ability assisted to this end. As an expert on the Scandinavian land and peoples as well as combat leadership in forest and mountainous tundra regions under arctic climate, he contributed substantially to the fact that the movement operation of the 20th Mountain Army from Lapland to northern Norway succeeded despite extraordinary difficulties.